Dwell analysis systems, turn your security camera to marketing tool. Dwell analysis security camera can measure effectiveness of promotions by how long customers dwell in front of displays. Increase customer shopping experience with realtime alerts. 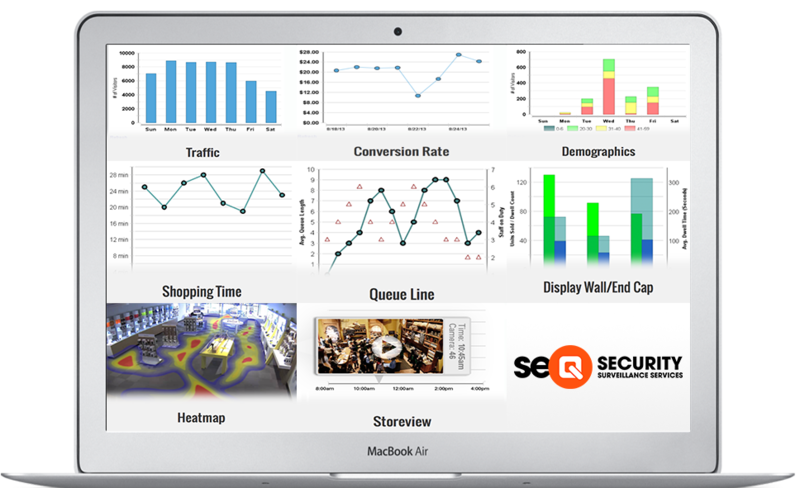 Give you the real insights of your retail stores. How is our dwell analytics security system works? Simply by placing a dwell security camera directly above a display, and draw a virtual area within the security camera view to define your area of interest to receive dwell analytics and alerts, then you are done. Next, the dwell security camera system is going to analyses every one with in your pre-defined area, calculate their dwell time, you can then receive an alert email if some one is dwelling in the security camera view for too long, and pull the video analytics data later. Please read through to see how this small business security camera system could help you better understand customer behaviour and better manage your business. Measure effectiveness of a display/promotions. Customer dwell analysis is the technology that make it possiable to measure where in the store shoppers stop and engage, Measure the length of time spent by customers in different areas of the store (Per security camera view based). Customer dwell analysis is the key element to understand the level of shopper engagement with individual fixtures, displays, or signs. Our customer are using this customer dwell time analysis to Determine general strategies for product placement and merchandising. Measure effectiveness of marketing displays, therefore increase ROI on advertising investment. understand customer behaviour visually as well statistically, help you to plan layouts and optimize marketing spending. Dwell analysis camera will alert you when customer need help. In your high ticket aisle, or departments that selling products normally customer requires professional opinions to make a decision. Install our dwell analysis security camera to over looking that area, the security camera now your secret shopper. when customer and dwell in front of that display for more than a predefined time, the dwell analysis system will send staff on duty a email alert, so you can take action instantly. Making you be on top of everything. Set up a dwell analysis security camera in the area, where you want to be noticed if any thing has stopped in there for longer than a predefined period. Dwell event can be also searched later from your security camera management system, making it a great time saver for investigation Making you be on top of everything.